Toronto theatre is navigating tricky times by making great art this winter. It’s a boom of full-throttle theatre-making, reflected most acutely in midsized-to-large companies taking on the sort of challenging, headline-making contemporary work that brings people to the theatre and inspires them to come back. It’s not all great, but it is all ambitious and that’s the best place to start. Stephen Karam’s personal dramedy about a family coming together for Thanksgiving dinner in their youngest daughter’s New York basement apartment is distinctly American in both subject and sensibility but one of the great trends of this winter season is that companies are no longer denying us great plays because they’re not specifically about us (the next two on the list are unavoidably British). 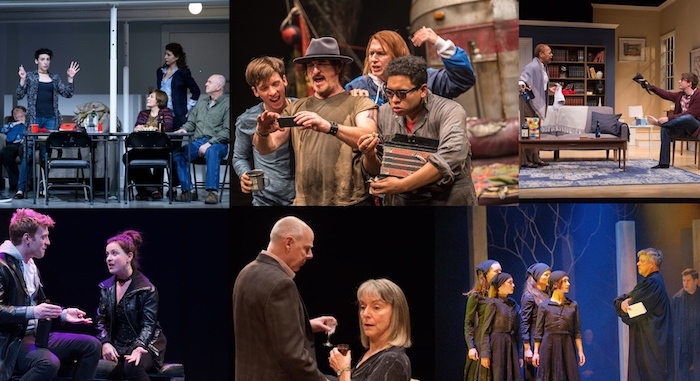 A pitch-perfect Canadian cast (highlighted by the Shaw Festival’s always wonderful Ric Reid in a rare Toronto performance), Jackie Maxwell’s restrained direction, and Karam’s recognizable characters bring the drama home and thoughtfully remind the audience that we all have our own problems but it’s all the same mess at the end of the day. Perhaps less universally relatable is the hyper-Britishness of Jez Butterworth’s nationalist hit about an ageing bad influence who refuses to be moved from his taxless pastoral haven by encroaching development and regulation. Outside-the-March’s incredible marketing team has been blasting the news of this production and its TV star leading man (Sons of Anarchy’s Kim Coates) for months. Combine that buzz with the accounts of near-religious-experience from people who saw Mark Rylance in the original production in New York or London and expectations were high for Jerusalem. Nick Blais’ immersive set design is spectacular and the ensemble is generally strong (I particularly enjoyed Christo Graham as a restless teen keen to see the world and Peter Fernandes as a playful townie who doesn’t “see the point in other countries”) but the leading performances felt forced to me and the play itself dated despite its relative newness, striving for profundity but not quite sure of its own point. The Company Theatre/Outside the March production is awesomely ambitious, technically proficient, and delightfully energetic but Jerusalem is not quite the holy land that was foretold. The concept of Mike Bartlett’s faux Shakespearean history play about a hypothetical future is one of the best elevator pitches for a play I’ve ever heard but the gimmick gets boring very fast as an ugly minimal set and dull plot details eclipse the production’s better elements. The CAA theatre’s inelegant proscenium limits director Joel Greenberg’s blocking options and David Schurmann’s leading performance is unremarkable but the supporting cast is thankfully full of never-fail players who elevate the simplistic characters (Patrick Galligan and Gray Powell play interchangeable politicians with impressive skill but little to work with) and do justice to the strong ones (this is as close as we’re likely to get to the Wade Bogert-O’Brien Romeo I’ve been pining after for years and it doesn’t disappoint). The play is at its best when it hands the reigns to Kate (a perfectly cast Shannon Taylor in Bartlett’s most compelling character reimagining by far) but, when it gets mired in the older generation, it loses steam quickly. It’s exciting to see Toronto’s well-funded (or somewhat funded, I guess) companies embracing indie favourite Kat Sandler‘s work with open arms and even more exciting to see them rewarded with sold-out, well-reviewed shows like Bang Bang that livened up the Factory mainspace with Sandler’s signature spitfire dialogue and youth-relevant, topical themes. A strong cast with particularly memorable turns from Karen Robinson and Richard Zeppieri do right by the complex but perhaps a bit timid script about a police shooting and Lindsay Dagger Junkin‘s insightfully detailed costumes help perfectly define the characters. But, while I’m honestly so happy to see it here, I’m not sure I’ll ever get used to Sandler’s work in this new context. To me, the magic of Sandler was always in the familial interconnectivity of her collaborations and the infectious energy of independent theatre, that superhuman “how did you do so much with so little?” thing that Theatre Brouhaha did better than pretty much anyone. Her characters were created for and on her actors, working with a regular company of players, and other collaborators, whose voices she knew perfectly how to deploy and who, in turn, could challenge and protect her with an acute understanding of her authorial voice. The circumstances that created my favourite Kat Sandler pieces aren’t easily replicated in a more professional setting. Nor should they be. We’re onto a different phase of her career, and that’s a good thing for both Sandler and the new audiences that will get to see her plays. You’ll just have to bear with me a bit while I struggle to let go of who she was when I fell in love with her work. I struggled to write this review, and the next one, as evidenced by the fact that they’re so unforgivably overdue. This competent, well-acted, nicely designed production of a somewhat forgettable Albee play is classic, almost throwback Soulpepper. It’s executed to a tee but lacks the creative pop of the company’s best work of the last few years, showcasing a stable of the company’s most established actors (Nancy Palk, Derek Boyes, Oliver Dennis, a particularly good Brenda Robins) reliable in their excellence but giving us nothing we haven’t seen from them many times before. I went on opening night, applauded emotionally as interim artistic director Alan Dilworth sincerely thanked the audience for coming to the theatre, and watched as Oliver Dennis and Nancy Palk as Tobias and Agnes wrestled with the limits of friendship and how much they are willing to give up out of loyalty to their old pals. Maybe that’s a rorschachian reading but it’s what I’ve got. I saw The Crucible the day after returning to Soulpepper for the first time this year and it’s in no way Hart House’s fault that I couldn’t get that company’s sublime production out of my head (Patricia Fagan played Elizabeth Proctor, Hannah Miller played Abigail Williams). The Hart House version is dark and moody, perhaps a bit overdramatic (David John Phillips chews so much scenery as Deputy Governor Thomas Danforth it’s a wonder he survived the run) but it features a few excellent performances (Melissa Taylor’s Elizabeth is beautifully surefooted, Nicholas Koy Santillo is a stirring Reverend Parris, and Courtney Lamanna wages quiet war against the broad villainy of Abigail with heartbreaking silent reactions). But mostly what I took away was a question of The Crucible‘s usefulness at this particular moment. It’s a brilliant play, an important indictment of McCarthyism and a key piece of the American dramatic canon that I’d hate to see left behind by history. And, though the tumult of the last few months brought new resonance to the discrediting of Mary Warren when she tries to tell the truth and heightened the hurt of John Proctor’s shaming of Abigail as “impure”, it’s hard not to think of The Crucible‘s story of young women who make false allegations as particularly unhelpful right now. There is certainly still so much value in The Crucible, so much clear-eyed warning to be headed, but this particular production was unfortunately timed in this particular moment.